We present a comprehensive database of 478 allometric equations to estimate biomass of trees and other life forms in Mexican forest and scrubland ecosystems. Accurate estimation of standing biomass in forests is a prerequisite for any approach to carbon storage and a number of additional applications. To provide a comprehensive database with allometric equations applicable to a large number of tree and shrub species of Mexico. An intensive literature search was carried out to pull together all publications related to allometric equations in the libraries of the most important forest research institutes across Mexico and the neighboring countries. A total of 478 equations were compiled. Four hundred fourteen equations included a detailed analysis of all compartments of the trees; 7 equations applied to shrubs, 15 to bamboos, and 2 to palms. The collected equations are applicable to a wide variety of forest ecosystems in Mexico ranging from desert scrublands in the North to lowland evergreen rainforests in the South. The attached database of allometric equations is possibly the most extensive compilation of equations currently available for Mexico. The database covers almost 100 % of the individuals recorded in the National Forest Inventory. The accurate estimation of forest biomass has been crucial for many applications: the commercial use of wood produced in studies of forest production (Morgan and Moss 1985), correlation of forest biomass with stand density (Baskerville 1965), in studies comparing biomass and production for individual tree species (Pastor and Bockheim 1981), in studies on forest fuel estimation (Agee 1983), and recently, to determine the role of forest biomass in the global carbon (C) cycle (Bombelli et al. 2009). Allometric equations are the most commonly used tool to estimate volume or biomass from forest inventory data (e.g., species, tree diameter, and height). Despite their importance, existing equations are often scattered over forest research centers, forest administrations, logging companies, and libraries (FAO 2013). The need for accurate equations is driven by the increasing need for information of biomass in forests for climate policy definition and formulation (cf. REDD+), which requires reliable estimations of carbon in forest ecosystems (e.g., Brown 2001; Wirth et al. 2003; Joosten et al. 2004; Rosenbaum et al. 2004). The estimation of the total above-ground biomass (TAGB) with an accuracy that allows the modeling of increments or decrements in carbon stored in the forest over relatively short periods of time (2–10 years) is increasingly required (Basuki et al. 2009). Under the United Nations Framework Convention on Climate Change (UNFCCC) and the 5-year forest resources assessments of FAO, countries need to report regularly the state of their forest resources, biomass densities, and carbon stocks and the results of emerging mechanisms such as Reducing Emissions from Deforestation in Developing Countries (REDD) that will require temporally and spatially fine-grained assessments of carbon stocks (UNFCCC 2008). Many models are developed for single tree species with different levels of uncertainty (Fehrmann and Kleinn 2006; Návar 2009a). There have also been various attempts to derive more flexible models, applicable for many species or for specific ecosystems, by meta-analysis of published equations to generate an operational database to be used in compliance with the Kyoto protocol (Zianis and Mencuccini 2004; Chave et al. 2005; Zianis et al. 2005; Návar 2010a, b). These models may be adequate to estimate biomass at a national or regional scale, but these may not correctly reflect the tree biomass in a specific area or project (Segura and Kanninen 2005). The most accurate method for the estimation of biomass is through cutting of trees and weighing of their parts. This destructive method is often used to validate other less intensive and costly methods such as the estimation of carbon stock using nondestructive in-situ measurements and remote sensing (Clark et al. 2001; Wang et al. 2003). Allometric equations developed on the basis of sparse measurements from destructive sampling of trees along a range of tree sizes are statistically related to more easily collected biophysical properties of trees, such as diameter at breast height, wood density, and total height (Basuki et al. 2009) by means of allometric equations. Diameter at breast height is the most commonly used parameter in forest inventories, whereas height normally is measured in a subset of trees to develop diameter-height curves (Bravo et al. 2007). In Mexico, there have been attempts to review and compile the available equations. Návar (2009a) did a review of equations developed to estimate biomass components of trees and shrubs of different forest communities in arid, semi-arid, subtropical, tropical, and temperate Latin-American ecosystems. De Jong et al. (2009) compiled a database of allometric equations for tree species or genera and equations at the level of ecosystems to estimate the biomass of the trees measured in the national forest inventory This paper is a continuation of the previous efforts to present an overview of the most accessible equations available in the literature to estimate biomass and carbon of Mexican tree species and forests. Henry et al. (2013) stressed the importance of such compilations of equations and pointed out that these should be made available in easy to use databases. 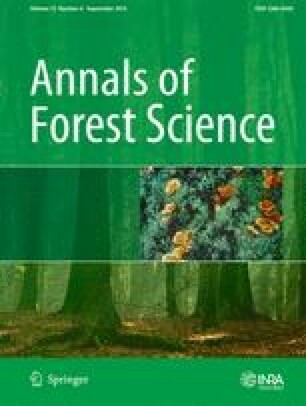 In this study, allometric equations developed for woody species growing in Mexico are compiled, and a database was developed to be used for forest above-ground biomass estimation (stem plus branches and foliage) at the level of individual tree species, species groups, genera, and ecosystems of Mexican forests. These can either be used to estimate biomass in certain forest stands or for national estimations of biomass. We tested the equation data base, to see to what extent it covers the total number of individuals registered in the national forest inventory, carried out between 2004 and 2007. An extensive revision of the literature was carried out to locate publications with allometric equations to estimate biomass in woody plants of Mexico. In the case of conventional publications (scientific papers and indexed peer-reviewed books), publicly available search engines were used such as Science Direct, Google Academic, Redalyc, and Scopus. Additionally, an extensive search was carried out to locate the so-called grey publications such as thesis, reports, and extensive summaries published in the proceedings of scientific meetings. Physical or virtual visits to academic institutions were carried out to locate these types of publications. In both cases, a series of keywords with logical operators were used to select the relevant literature: biomass, above-ground biomass, above-ground forest biomass, total tree weight, carbon content of biomass, carbon sequestration, harvestable volume, expansion factors for trees, biomass expansion factor, biomass density, carbon density, allometric equations, allometric equations to estimate biomass, and regression models. Once a document with an allometric equation was located, the relevant information was extracted and systematically put into a database with various fields: species, genus, life form, type of vegetation, size of the plant, age of the vegetation, climatic characteristics, type of management, type of allometric equation, and their variables used, among others. More general equations were also put into the database recording the same information such as equations applicable for genera or groups of species, equations applicable for specific ecosystems, and generic type of equations. The equations are grouped according to life form and independent variables used to calculate biomass, type of allometric equation, forest type for which the equation is applicable, and the number of equations in each common plant family. To test the potential of the database, we estimated the number of individuals covered by a biomass equation that are recorded in the National Forest and Soil Inventory 2004–2009 (INFyS). The individuals of the INFyS that were determined at the level of species were taken into consideration (tree, shrub, bamboo, and palm). The scientific names were analysed with the package Taxonstand version 1.0 (Cayuela et al. 2012) within the R-software environment (R Development Core Team 2012) to correct the scientific names due to taxonomic revisions, orthographic corrections, and elimination of synonyms validating the names according to the latest revisions by taxonomic experts (The Plant List 2010). We classified the species into the following three groups: (1) species for which the equation database contained an equation at the level of species, (2) species with an equation at the level of genus, and (3) species that are covered by an equation developed for a certain group of species or ecosystem. Once the name of the plants in the INFyS database was checked for consistency, the number of plant records, for which some type of equation was available, was counted. The extensive search for literature included physical and virtual visits to a total of 42 national institutes of higher education and research and 4 foreign institutes. A total of 29 scientific journals were searched with a variety of search engines. A total of 225 documents were located, such as scientific papers, thesis, and extensive memories of scientific events. Each document was checked to evaluate its relevance for the database, as the search with keywords also detected papers, which used allometric equations developed by other authors. As such, a total of 80 documents were selected, from which all relevant data were extracted and inserted in the general database, so as to provide information on the species, the range of the independent variables and site-specific characteristics. Duplicate publications (thesis converted to scientific paper) were eliminated if these contained the same information, which resulted in a final list of 69 documents. A total of 478 allometric equations were collected from the literature to estimate total biomass, carbon in biomass, above-ground biomass, or root biomass for trees (414), shrubs (47), bamboos (15), and palms (2; Table 1). About 150 equations were specifically developed for one species, whereas 15 equations were developed at the level of genus, and 26 equations were applicable for a group of species or species within a certain ecosystem. Most of the equations estimated total biomass, although some used an additive formula, summing separately estimated biomass of trunks, branches and leaves, or other parts. The most common variables used in the equations were diameter at breast height (DBH, in 384 equations) and total height (TH, in 96 equations; Table 2). Other variables used include diameter at other heights (0.30 in 49 equations, 0.10 in 15 equations, and basal diameter in 32 equations), basal area (BA, 19 eq. ), crown diameter (DC, 1 eq. ), crown height (HC, 3 eq. ), trunk volume (Vol, 10 eq. ), and stem basal perimeter (BP, 1 eq. ; Table 2). The non-linear equation was the most common type of model published (295 equations) followed by the exponential type of equations (112 eq. ), whereas 52 equations were polynomial, two linear and 17 equations had at least part of the variables expressed at a logarithmic scale (Table 3). Most of the equations were applicable for species belonging to seven upland forest types (228 equations), whereas 150 equations were found for five lowland forest types, whereas 80 equations are associated with two types of scrubland vegetation (Table 4). For Pinus patula, a total of 14 equations have been published; of which, seven estimate total above-ground biomass with varying range of diameters for which the equations are applicable. For example, Pacheco (2011) developed the equation in the state of Oaxaca for individuals with DBH between 5 and 30 cm Castellanos et al. (1996): in Puebla, with indidividuals with DBH between 5 and 45 cm; and Díaz (2005) in Tlaxcala, with a range of DBH between 6.7 and 64.1 cm. Comparing the outcome of the three models, estimating the biomass of individuals registered in the national inventory, shows that they do not differ much even outside the range of diameters for which they were developed (Fig. 1). The models were developed in 26 out of 32 federal states, with the highest numbers of equations in Durango and Chihuahua; both are very important wood-producing states. Some models were developed for species occurring in more than one state (Návar et al. 2004a, b; Návar 2009a, b; Návar 2010a, b). In the Appendix, we present all the equations of the database. Most of the reports include some measures of confidence of the equation to replicate the results, such as the proportion of variance explained by the model, the difference between the estimator and the real value, or standard error. To test the extent to which the collected equations apply to the national forest inventory data, we compared the equation database with the 1,023,723 individuals recorded in the National Forest and Soil Inventory 2004–2009 (INFyS). The INFyS contain individuals belonging to 2623 species of 787 taxonomic genera. After the analysis with Taxonstand, the inventory contained 2175 species of 708 genera. A total of 41 % of the individuals of the INFyS were covered by a specific equation, 36 % by an equation developed for a genus, and the remaining 22 % were almost completely covered by either a species group or ecosystem equation. Thus, almost 100 % of the individuals of the INFyS are covered one or more nationally developed allometric equation to estimate the biomass (Fig. 2). The allometric models for woody plant species of Mexico cover a wide range of species and forest ecosystems, parameters used to relate biomass to tree structural variables, and type of regression. More than 40 % of the individuals recorded in the INFyS 2004–2009 are covered by a species-specific allometric equation. Biomass can be estimated with equations that have been developed either for the same species, species belonging to the same genus or ecosystem, each with their specific level of uncertainty. Application of empirical equations outside the region from which they were developed or extrapolation of biomass estimated beyond the range of the independent variables could unpredictably increase uncertainty. If the equation is developed for smaller trees, applying it to trees much larger than the range increases substantially the uncertainty of the estimation (Brown 1997). In order to reduce the uncertainty of the models in relation to applying these to trees outside the dimensions for which the model was developed or outside the ecological condition where the sampled trees occurred, or other factors that may create the uncertainty in the estimations, a sampling procedure needs to be designed to validate, simplify or adjust the available models, such as the small trees sampling scheme proposed by Zianis and Mencuccini (2004) or the non-sampling scheme methodology proposed by Návar (2010a, b), who applied the Central Limit Theorem for equations of neighboring tree species or genus. Bayesian analysis may also provide the means to circumvent such caveats, as well. Due to the high diversity of tree species, it is not efficient to develop models for each species. Validating and improving models developed for certain ecosystems may be a viable solution, such as the incorporation of wood density as an independent variable (Urquiza-Haas et al. 2007; Chave et al. 2014). Also, equations that use total height (TH) and DBH as independent variables are generally more widely applicable than equations with only DBH, as these may capture better the variation in the DBH/TH ratio due to ecological conditions. Návar et al. (2013) found that other more complex variables such as tree slenderness (DBH/TH), tree cylindrical (VOL/(DBH2TH)) or a compound form factor (DBH/TH*VOL/(DBH2TH)) explain much more above-ground variability than H alone, and avoid multicollinearity problems. Furthermore, height is often difficult to measure, particularly in dense tropical forests. Equally, if ecological conditions of the trees in the inventory are very different from the conditions where the equation was developed, the tree architecture may change substantially (Rykiel 1996; Oldeman 1990). Particularly in countries like Mexico where a high variety of ecological conditions and management practices may create a high variety in architectural structures of the trees of the same species, it is important to estimate the error associated with this variation. Other factors that may influence the distribution of biomass and as such the uncertainty in biomass estimations, are related to the openness or closeness of the canopy, where more biomass is allocated to branches in trees growing in open spaces, compared to the same species in closed canopies (see also Dietze et al. 2008). As such, the slenderness, cylindrical or composite form factors introduced by Návar (2010b) explain physically this variance. The type of equation may also influence its applicability outside the range for which it was developed. Non-linear models of the type B = a. DBHb are more robust outside the range for which these are developed (e.g., see Fig. 1) and as these approach the fractal allometry of B in relation to DBH (West et al. 1999; Zianis and Mencuccini 2004) in contrast to polynomial models that often present abnormal behavior outside its range, such as negative values or reducing the estimation with increasing DBH. Mexico possesses a great wealth of allometric equations to estimate biomass of a high variety of tree species or forest ecosystems. This paper tries to compile the most accessible models published in the literature and to make these available for scientific research, developing national biomass estimations of the forest ecosystem, or to design a scheme to validate the use of each of them. Efforts to improve the database directed toward validating the models under different conditions with cost-effective sampling and modeling procedures, such as those proposed by Zianis and Mencuccini (2004), are key to reduce the uncertainties of the estimations of biomass. We would like to thank the anonymous revisers of the earlier drafts of the paper, which resulted in important improvements of the current version. The research was partially funded by ECOSUR, The National Forestry Commission (CONAFOR), the Mexican representation of the United Nations Environmental Programme (PNUD-Mexico), and Programa Mexicano del Carbono. The primary data will be made available through the Globallometree database (http://www.globallometree.org). Alnus sp.| Clethra sp.| Inga sp.| Liquidambar sp.| Quercus sp.| Rapanea sp. Alnus sp.| Clethra sp.| Rapanea sp. Quercus sp.| Inga sp.| Liquidambar sp.